I have to say the news that 55 Italian MPs have written to the House of Lords (via The Times) urging for a rejection of the three-parent-babies law recently approved by the House of Commons got me by surprise. The procedure and reason to support or oppose it are summarised nicely by The Guardian (as always, Wikipedia is also worth a read) so I won't repeat them here. What really shocked me is the presumption by these 55 MPs that their personal belief has the potential to influence legislation in a sovereign Country. Scientists supported the bill, and even the Catholic Church stayed out of it (directly, although I'd be interested in knowing the religious position of these 55 MPs) while the Church of England has, not surprisingly, spoken against it, as did a small number of UK MPs. Why should they matter? What does their opinion bring to the table? Frankly, I find the very idea of writing this letter ridiculous. On the other side, I wasn't surprised by their position. And not because I share it or because I happen to know any of these MPs. Quite the opposite. But because I got to understand (and try to actively oppose) something profound about Italy: it is a chronically non-scientific society. I read in the letter that according to the 55 MPs this procedure " could have uncontrollable and unforeseeable consequences, affecting future generations and modifying genetic heritage in an irreversible way, inevitably affecting the human species as a whole" ( expresso.co.uk). Maybe it's me, but this sounds like the argument a rogue scientist from a SciFi film where mankind reproduces artificially would use to defend clonation, designer babies and 'controlled descendance'. [Hopefully I don't have to remind in here how any sexual reproduction inevitably affects the genetic heritage and how this is key for evolution and survival (see founder effect)]. So what are they really saying, besides that to have an opinion about a scientific process one does not need to have a good understanding of science, biology or sexual reproduction (not to mention evolution)? I'm not concerned here with the arguments for or against the bill (more qualified opinions than mine are easily accessible online, and a nice summary can be found on The Telegraph) as I personally believe that the ideological and/or religious ideas of individual should not influence the laws of a secular state and that each individual should be given enough information to be able to decide according to their conscience (within the limits of the law). The point I want to make here is that one must be clear on what the concerns are actually about. 1. Understand Science to Talk Science. Discussion of scientific questions by the Italian public opinion and political system invariably drifts away from the underlying science. The rise and fall of the Stamina Method shows how windy the path to scientific approval can be, and how little the voice of scientists is taken into account. 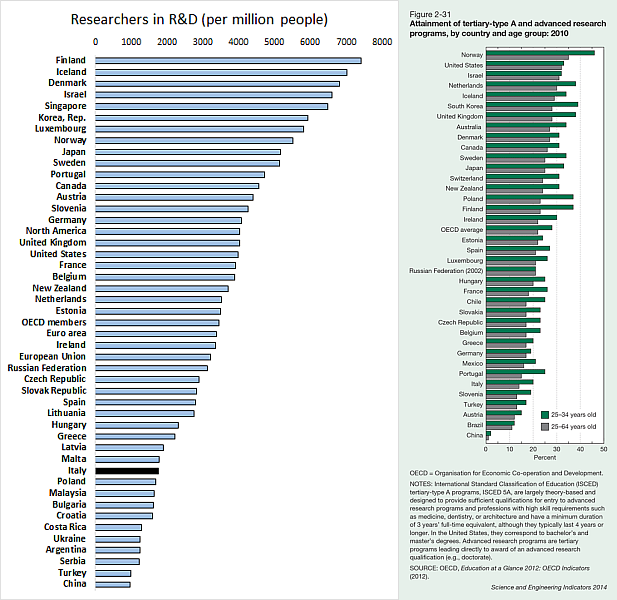 The number of R&D scientist as well as higher education students taking scientific disciplines is among the lowest in Western Countries (figure 1: left from WorldBankData, right by NSF). Let me be clear: what I'm talking about here is how uncommon science and the scientific method are in Italian society, which is a key determinant to understand how much (little) they are part of political debates, social policy development, and public opinion in general. 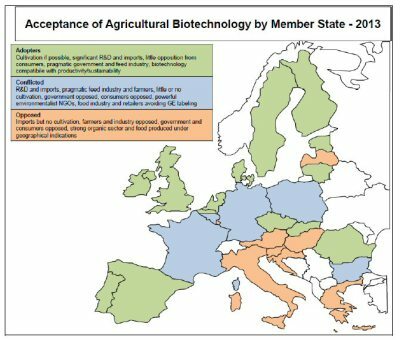 Let's take the case of GM crops to map Italy's position among the EU (figure 2): hardly the right place for the third largest economy. How did Italy become so wary of GMOs, new genetic/IVF therapies and biosciences in general? I'll leave to others to analyse and explain how sociological, historical and religious elements shaped the attitude of the Italian State and Society towards science. What is clear is that a non-scientific public opinion is left drifting in its own concerns (the fear of the unknown is a powerful one) will very little external chaperoning, in the form of politicians trusting scientists, and scientists reaching out to the general public. Some of this seems to be changing now (see for example the latest intake of ' Lifetime Senators' in 2013 that included two scientists) but there's a large gap still to be filled. And no-one seems to be particularly keen on doing this. What are the effects of a Country that restrict applications and do not support R&D efficiently? A likely outcome is that investments in higher education (another huge topic, but I'll have to leave it for another time) translate poorly in commercialisation (figure 3, from EuropeanCommission) and new businesses (figure 4, from Wikipedia). 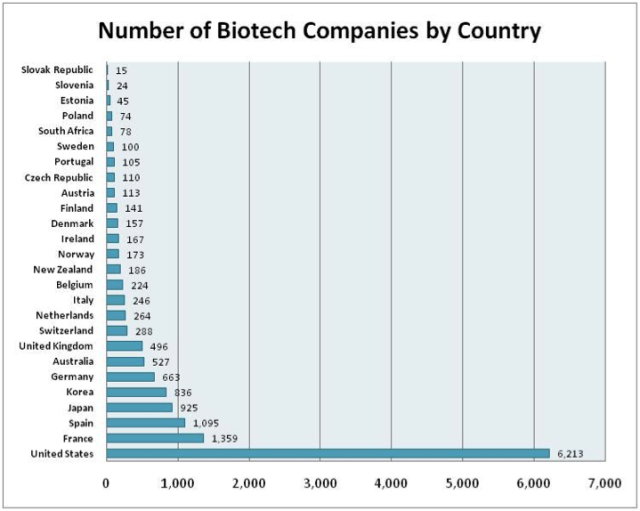 The paradox is that according to EuropaBio Italy is not a bad place where to start a Biotech (despite its bureaucracy). Many elements contribute to the low share of Pharma and Biotech companies in the Country, the main one being the European open market and freedom of movement. Chronically overlooking the importance of science as a founding element of a contemporary society results in talent and business bleeding out of Italy. So, if companies move, scientists emigrate and ideas flow, why shouldn't a couple at risk of transmitting a mitochondrial disorder to their children invest in a £50 flight ticket and get their treatment in the UK? If only the House of Lords was to stop that bill. Oh, is that what the letter is about?? My interests range from the understanding of natural processes at molecular level to the use of biochemical approaches for applications in Biotech and Synthetic Biology. Besides research, I developed a strong interest in scientific publishing and am a strong supporter of open access models and new publication formats. Great post this is.Very helpful for those who are looking to play free and online video games.Follow this happy wheels online and get all the latest features at this Happy wheels Junction.Play and share to the others.Thank you so much. The biotech companies figure should use per capita, otherwise it is very difficult to interpret. "the Country" <- remove cap. Please type the text so it is quotable. 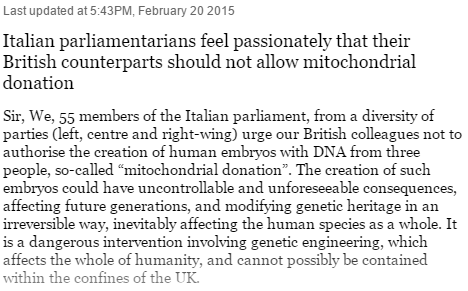 "Sir, We, 55 members of the Italian parliament, from a diversity of parties (left, centre and right-wing) urge our British colleagues not to authorise the creation of human embryos with DNA from three people, so-called “mitochondrial donation”. The creation of such embryos could have uncontrollable and unforeseeable consequences, affecting future generations, and modifying genetic heritage in an irreversible way, inevitably affecting the human species as a whole. It is a dangerous intervention involving genetic engineering, which affects the whole of humanity, and cannot possibly be contained within the confines of the UK." I fetched this from the HTML source.